Throughout the ages, men and women have endlessly sought the greener side of the hill. Their migrations, collisions, conquests and interactions have given rise to the spectacular profusion of cultures, races, languages and polities that now proliferates on every continent.This incessant restlessness inspired Davies’s own. After decades of writing about European history, and like Tennyson’s ageing Ulysses longing for one last adventure, he embarked upon an extended journey that took him right round the world to a score of hitherto unfamiliar countries. His aims were to test his powers of observation and to revel in the exotic, but equally to encounter history in a new way. 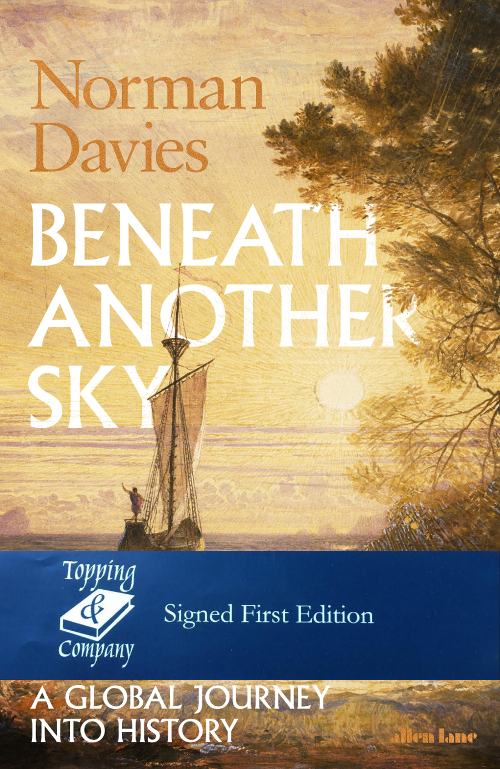 Beneath Another Sky is partly a historian’s travelogue, partly a highly engaging exploration of events and personalities that have fashioned today’s world – and entirely sui generis.Davies’s circumnavigation takes him to Baku, the Emirates, India, Malaysia, Mauritius, Tasmania, Tahiti, Texas, Madeira and many places in between. At every stop, he not only describes the current scene but also excavates the layers of accumulated experience that underpin the present. He tramps round ancient temples and weird museums, summarises the complexity of Indian castes, Austronesian languages and Pacific explorations, delves into the fate of indigenous peoples and of a missing Malaysian airliner, reflects on cultural conflict in Cornwall, uncovers the Nazi origins of Frankfurt airport and lectures on imperialism in a desert oasis. ‘Everything has its history’, he writes, ‘including the history of finding one’s way or of getting lost.’The personality of the author comes across strongly – wry, romantic, occasionally grumpy, but with an endless curiosity and appetite for knowledge. As always, Norman Davies watches the historical horizon as well as what is close at hand, and brilliantly complicates our view of the past.